Thanks to regular reader and old friend Pete Vermilyea–thanks, Pete!–I made a fascinating discovery today. Ulric Dahlgren was born in 1842 in Bucks County, Pennsylvania. At age seven, his mother dead, the family moved to Washington, DC when his father was appointed to command the Navy’s Ordnance Bureau. While the family lived in Washington, Ulric attended the Rittenhouse Academy, a prestigious private boy’s school. Ulric did not graduate, but left early in 1858, his restless nature prompting him to search for greater adventures. One of his classmates at the Rittenhouse Academy–also born in 1842–was David Herrold. 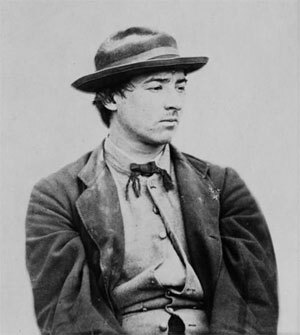 Herrold, of course, was one of the Lincoln assassination conspirators who fled with John Wilkes Booth. Herrold surrendered but Booth refused, and Booth was killed by Boston Corbett of the 16th New York Cavalry. Herrold was hanged with the rest of the conspirators. Herrold likewise did not graduate from the Rittenhouse Academy–he transferred to another school–but definitely was a student there while Dahlgren was there, and they were definitely classmates during their time there together. I own a copy of the 1858 school circular for the Rittenhouse Academy. It includes a complete listing of all students enrolled that year, as well as the full curriculum for the school. Because Herrold was not a student there that year, his name does not appear in the listing, which is why it never even occurred to me that they would have been classmates. However, they were born the same year, so they would have had to have been classmates. But for Pete tipping me off about this, I never even would have thought to investigate or even make the connection. You can bet that I will be mentioning it in the book….. I find it fascinating that two young men of great promise who were boyhood schoolmates both died in the midst of attempts to assassinate heads of state. I’m sure it’s coincidence, but wow, it surely is interesting and intriguing. Thanks again for tipping me off to this fascinating find, Pete. Please allow me to update you all on the problems you’ve had accessing this site the past two days. Yesterday, our web host was the subject of a dedicated denial of service attack by hackers that caused their systems to crash. Once they got back up today, the server itself had a failure, and the web sites hosted on it had to be migrated to a new server. Everything now seems to have been resolved, and everything seems to be pretty much back to normal. I apologize for any inconvenience, and can only join you in hoping that it’s all been resolved and for good. When I was in college, I worked hard at trying to make the college baseball team as a pitcher. At my very best, I was a very mediocre right handed relief pitcher. During the winter and spring of my sophomore year, as I worked at getting ready for the season, I did a lot of pitching with a friend of mine catching. In the process of working on my slider, I developed an absolutely hellacious case of tendonitis in my right elbow. Specifically, it’s tennis elbow, as then tendons on top are the ones causing the trouble. I spent a lot of time in trainer’s room, missed the season, and thought I was over it. That summer–1981–I ran the baseball program at a summer camp for rich kids in Massachusetts and spent way, way too much time pitching. This time, I did pretty much irreparable harm to it. That ended my baseball career, such as it was. It took a lot of physical therapy, prescription strength Motrin, and a lot of rest before it finally settled down to some semblance of normalcy. The problem has periodically flared up from time to time over the past 25 years. I had one in November, thought it was nothing out of the ordinary, and treated it as I always have. However, this time, it didn’t get better. Instead, it got steadily worse. I finally broke down and saw the orthopedist today. He gave me an excruciatingly painful cortisone shot right into the aggravated tendon, and told me to rest it. That includes typing. So, I apologize and regret to tell you that posts will probably be short and somewhat sparse for the next couple of weeks while I try to limit my typing to that which is really necessary for my job. I regret any inconvenience that this might cause and ask your indulgence. I will be back. I just need to rest it for a while. This is especially intriguing news…. Scott Dawson, a native of Hatteras Island and now a resident of Colington, has shared the location of a discovery he made on National Park Service property with that agency, which has now secured the area and posted surveillance to insure that intruders don’t disturb the site. Doug Stover, park historian of the Park Service, said that park officials think that the site may be the remains of Fort Blanchard, a Civil War fort. But if proven correct in his beliefs, Dawson will be the envy of many archaeologists who have spent their careers in the search of the long-lost Ft. Raleigh, Ralph Lane’s 1585 fort on Roanoke Island. Dawson located the site on Feb. 6 and shared his findings with the Sentinel on the following day. To ensure the preservation of the site, it was agreed at that time to alert the National Park Service, and that the Outer Banks Sentinel would delay writing about it until officials had time to examine and secure the site. A call was placed to Stover by this reporter to make arrangements for Dawson to take officials to the area. Since then, the site which includes earthworks, trenches and embankments, has been visited by several interested parties, including NPS officials, head of the Lost Colony Center for Science and Research, Fred Willard and Dawson. During one of those visits, Dawson, under a permit issued by the NPS, used a metal detector and, he said, there were numerous “hits,” most of which indicated silver down under the layers of dirt. Dawson agreed that there is probably a Civil War encampment on the top of the site, but said that he believes the encampment is on top of the 1585 Ft. Raleigh. “Through careful analysis of the primary sources of the 16th century voyages,” said Dawson, “I found two sentences from two separate first-hand accounts that gave me minor clues as to the location of the fort. “Later, I found vague references to the fort’s location in regimental stories from various Civil War first-hand accounts. They gave me enough confidence that I narrowed the location down to one of two places. “Both places contained fresh water according to detailed maps from the 1700’s. I decided to find where the fresh water sources used to be and then walk in a spiral pattern from them until I was at a radius of 100 meters. It didn’t take that long. On Feb. 6, on my way to one of locations I had narrowed it down to, I found deep earthworks. I took some pictures and continued to search the area. Then I found more trenches cutting 90 degree angles at times and forming a large enclosure. Dawson’s primary sources for locating the site were documents written almost three centuries apart. According to Dawson, during the Civil War, the Union Army’s 27th Massachusetts camped out on top of Ft. Raleigh. He obtained that information, in part, from a letter written by William Derby, a soldier in the 27th. Derby also wrote that guards were posted to keep vandals out of the area which they were told was the original Ft. Raleigh. “This is all over their [written] regimental history,” said Dawson. “However, no one knew where they camped. Colonel Green, a Confederate commander in charge of the 2nd North Carolina, landed at Wiers Point at the end of the battle on Feb. 8, 1862. He arrived just in time to surrender because the fight was already over, but before he did, he had his men throw all their guns and equipment into a ravine — most likely the one that is on Wiers Point since that is where he landed and surrendered. “On the morning of February 9th, the 27th Massachusetts found these guns, and the record says they were in a ravine close by. So I went to that ravine and looked all over the place starting with a point of land that runs out into the marsh because, in John White’s account, he says that in 1590 he went to a point of land opposite Dasamonquepue, which is an Indian town in Manns Harbor. “So I went to the point of land next to the ravine south of Wiers Point. In John White’s account, it never says why he went to that point of land. Only after he went there did he then round the northern tip to the settlement. Obviously, the settlement was not inside the fort or they would not have built a palisade around it. “Also in 1587, when they are looking for Grenville’s 15 men, they searched for a day and then took the boat to the fort the following day. He probably went to the settlement and after [finding] no sign of the men, then went to the fort where barracks or a few more houses were. Stover said that the next phase in the NPS investigation will be to scan the area after clearing away some of the brush. And in March, NPS archeologist Bennie Keel will visit the site to make his own preliminary assessment. In the meantime, until further information is available, Ft. Raleigh remains a mystery. Although in the future the NPS may partner with private archaeologists on the project, currently it is a Park Service project. I believe I met Scott Dawson last May when I spoke to the Outer Banks Civil War Roundtable, which was a very interesting experience. If Dawson is correct, this is a find of epic proportions. Not only does it answer an important Civil War question, it solves a mystery that has befuddled archaelogists for centuries. Let’s hope that Dawson is correct. I spent three years of my life in the lovely, historic town of Carlisle, Pennsylvania. Although it’s been nearly 24 years since I left there, I still love the place. I still visit every opportunity that I get. 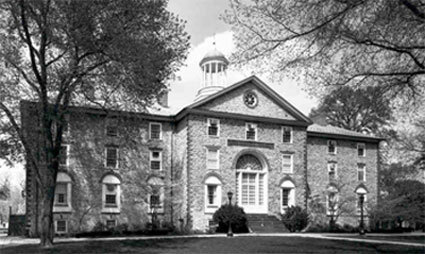 My alma mater, Dickinson College, was founded in 1773 by Dr.Benjamin Rush, the famous Philadelphia physician and patriot (Dr. Rush signed the Declaration of Independence). The main building on campus, Old West, was burned by the British during the War of 1812. The college was visited by the Confederates in the days just before the Battle of Gettysburg, and was shelled by Jeb Stuart’s horse artillery on the night of July 1, 1863. We boast a chief justice of the Supreme Court of the United States and a President of the United States (albeit probably the worst of both–Taney and Buchanan) among our alumni. I am a member of the College’s Class of 1983, meaning that I graduated as part of the 210th graduating class (old friend and mentor Brian Pohanka was a member of the Class of 1979). Matt Pinsker, who, along with fellow blogger Brian Dirck, is one of the finest of the current generation of Lincoln scholars, and the holder of the Brian C. Pohanka Chair of Civil War History, teaches at Dickinson. We’re lucky to have him. Next to the college’s campus is the Dickinson School of Law. Until just a few years ago, the School of Law was completely independent–it is not affiliated with the College in any fashion. However, during the 1990’s, Penn State University absorbed it, as Penn State did not have a law school of its own and craved one. By absorbing the School of Law, Penn State was able to acquire a well-respected and long-established law school, complete with its own facilities (although there has been some talk about Penn State moving it out of Carlisle and up to its main campus in State College, which would REALLY be a tragedy). The town also has a great deal of history. It was founded in the 1750’s as a supply post for the British army. It played an important role during the French and Indian War, and is the home of the Carlisle Barracks, which is the site of the United States Army War College and the U. S. Army Military History Institute. The Barracks were an important training depot where cavalry recruits learned their trade. Fitz Lee’s troopers set the place ablaze on the night of July 1, 1863. The Barracks also housed the Carlisle Indian School, famed for Jim Thorpe, considered the world’s greatest athlete of his era. Molly Pitcher, of Battle of Monmouth fame, is buried in the town cemetery. The town also features an excellent museum and historical society dedicated to the county’s rich historic legacy. There were several stops on the Underground Railroad in Carlisle–my fraternity used to use one of those sites to initiate our pledges. Carlisle is the county seat of Cumberland County. The town is filled with beautiful, historic structures such as you would expect from a town founded in the mid-eighteenth century. The handsome old courthouse on the town square still proudly shows damage from one of James Breathed’s guns when the Confederate horse artillery shelled the town that awful night in July 1863. 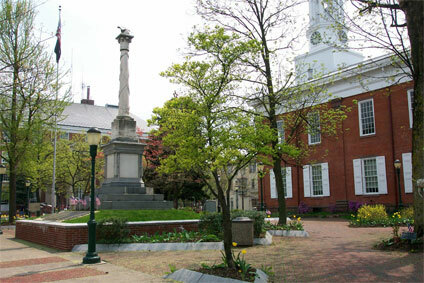 There are a number of Pennsylvania historical markers around the town, including several dedicated to the Gettysburg Campaign, and there is also a very handsome monument to Cumberland County’s contributions to the Union victory in the Civil War on the town square, right next to the old courthouse. Although Carlisle is a small town of only 25,000 or so, it’s one of my very favorite places, and a place I never miss visiting when I’m in the area. It’s one of those wonderful spots where you can literally feel the history as you walk through the town. In particular, it has a rich Civil War legacy, and I commend it to you. It’s well worth a visit. Jenny Goellnitz is a fellow Buckeye, lawyer, and Civil War fanatic who maintains an eclectic blog called The Learned Foot. There are lots of interesting things on Jenny’s blog, including a link to her excellent A. P. Hill site. I’ve corresponded some with Jenny, mostly touching base on our common interests in the law and the Civil War, and she’s been unfailing delightful to deal with. She’s just starting her legal career, whereas I’m old and jaded, and I’ve tried to offer the occasional useful tip. Thanks to Dimitri Rotov, I’ve learned that Jenny is facing a real health challenge that she has named “lumpy.” As she says she hates the real name for her problem, lumpy will suffice for now. Not surprisingly, Jenny has promised to be open about her fight with lumpy and to keep us posted, and I will be sure to check in from time to time to see how she’s doing. I wanted to use this opportunity and this bully pulpit of mine to wish Jenny the very best with her fight with lumpy, and I hope that she makes a quick and full recovery so that she can resume her running, writing, and work with the law. Get well soon, Jenny. A gentleman named Ira Shaffer contacted me today and invited me to become a member of the board of trustees of the Friends of the Alligator. Mr. Shaffer has an illustrious ancestor, Marshal Joachim Murat, perhaps the greatest of all cavalrymen. I was very pleased to accept the offer, and thought it might be nice to post some information about the Alligator. The creation of French inventor, Brutus De Villeroi. Whether a deliberate publicity stunt or not, DeVilleroi succeeded in convincing the Union Navy that he could produce a submersible warship from which a diver could place an explosive charge under an enemy ship. Six months later, in November 1861, he was under contract to build the Union’s first submarine, Alligator. Built in Philadelphia, the 47-foot long Alligator was primarily intended to counter the threat of the Confederate ironclad, the Virginia. Although the Navy specified that the submarine’s construction take no more than 40 days at a cost of $14,000, the project suffered long delays. As project supervisor, DeVilleroi objected to changes in certain aspects of his plans for the vessel’s construction. In response, he effectively exited himself from the process and was later officially dismissed as supervisor. About a month after its launch on May 1,1862, the oar-propelled submarine was towed to Hampton Roads, Virginia. Her first missions: to destroy a strategically important bridge across the Appomattox River and to clear away obstructions in the James River. When the Alligator arrived at the James River, with civilian Samuel Eakins in charge, a fierce battle was being waged in the area. 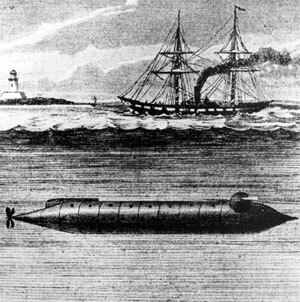 Because neither the James nor the Appomattox was deep enough to permit the vessel to submerge, it was feared that even a partially visible submarine would be vulnerable to seizure by the Confederates. The Alligator was sent to the Washington Navy Yard, for further experimentation and testing. In August 1862, Lt. Thomas O. Selfridge accepted command of the submarine, after being promised promotion to captain if he and the Alligator’s new crew destroyed the new Confederate ironclad, the Virginia II. During test runs in the Potomac, the Alligator proved to be underpowered and unwieldy. During one particular trial, the sub’s air quickly grew foul, the crew panicked, and all tried to get out of the same hatch at the same time–prompting Selfridge to call the whole enterprise â€œa failure.â€ He and his crew were reassigned and the vessel was sent to dry dock for extensive conversion. The dream of using this â€œsecret weaponâ€ against the Virginia II was scrapped. Over the next six months, the Alligator’s system of oars was replaced by a screw propeller. In early spring 1863, President Lincoln observed a demonstration of the â€œimprovedâ€ vessel. Shortly thereafter, RADM Samuel Dupont ordered the Alligator, once again commanded by Eakins, to participate in the capture of Charleston. Towed by the USS Sumpter, the unmanned Alligator left Washington for Port Royal on March 31, 1863. On April 2nd, a fierce storm forced the crew of the endangered Sumpter to cut the submarine adrift, somewhere off the Cape Hatteras coast. According to reports sent to Secretary of the Navy Welles, the Alligator was “lost” at sea. Specifications: She was said to be about 30′ long and 6′ or 8′ in diameter. “It was made of iron, with the upper part pierced for small circular plates of glass, for light, and in it were several water tight compartments.” It had originally been fitted with sixteen paddles protruding from the sides to be worked by men inside, but on July 3, 1862, she was ordered to Washington Navy Yard to have her folding oars replaced by a propeller which was powered by a hand crank. It was said to be capable of seven knots. “The Alligator was to have been manned by sixteen men, besides one in submarine armor, who was the explorer, and a captain who was to steer the craft. An air pump in the center of the machine, to which were attached two air tubes, attached to floats, was to furnish air to the occupants, the machine being of course air tight. The entrance to it was through a man-hole at one end, which was covered with an iron plate, with leather packing.” She was to have been submerged by the flooding of compartments. The Alligator was also described as a “semi-submarine boat,” 46′ (or 47′) long and 4’6″ in diameter, with a crew of seventeen. In other words, she was the Union’s version of the Hunley. The National Oceanic and Atmospheric Administration (NOAA) is conducting the search for the Alligator, which searsh goes on. NOAA plans to raise her and put her on display just as the Hunley was raised and put on display. NOAA has a very informative web site dedicated to its effort to locate the Alligator. The Friends of the Alligator intend to construct and house a full-scale working replica of the Alligator as a major Civil War tourism attraction in the greater Philadelphia metro area (where she was built) – as well as to conduct symposia and educational opportunities to the membership. I’m honored to have been asked to assist in bringing a major Civil War attraction to my home town of Philadelphia. My antipathy for Google’s book scanning copyright infringement scheme is well-documented here, and I won’t repeat my rants about why I am so vehemently opposed to that portion of the Google program that deals with works that are still subject to copyright protection. To reiterate one point: I have absolutely no problem or issue with that portion of the Google program that seeks to digitize public domain works, and wholeheartedly support that aspect of it. My gripe, stated here in one of my very first blog posts, has never changed. In any event, a group of Belgian newspapers sued Google in Belgian courts, claiming that the posting of headlines and hyperlinks to their articles constituted copyright infringement under Belgian law. The Belgian court agreed, finding in favor of the newspapers. “Google is reproducing and publishing works protected by copyright,” the court said. “Google cannot call on any exceptions set out by law relating to copyright or similar rights.” Not surprisingly, Google has vowed to appeal, and its general counsel declared “”This ruling does not mean that everywhere else or every other judge in any other country would rule in the same, even in Belgium. There are conflicting rulings on those issues which are fairly new and complicated.” The Associated Press article on the court’s decision may be found here. While Google may be correct in its assessment that there are conflicting rulings and that it does not mean that every judge in every court in every country would reach the same conclusion, the Belgian court’s decision represents the first time that a court of law has told Google that it’s dead wrong, and that there would be a monetary price for its arrogance. I’m no expert on Belgian copyright law, and wouldn’t begin to be able to comment upon whether the court was right of wrong, but I know U. S. copyright law pretty well, and I remain absolutely convinced that the book scanning program is an illegal infringement upon my copyright rights. I am eagerly awaiting the outcome of the U. S. litigation…. J. D. and I got a letter from the guy in Westminster who accused us of plagiarizing. We spent a lot of time composing a response to him that pointed out all of the reasons why there’s no way that we could have stolen his work when we’d never seen it. His reply letter indicates that he is now satisfied that we didn’t plagiarize from him, he apologized for the accusation, and then got all warm and fuzzy, pointing out a few factual errors we made in our work, and offering to show us around Westminster when we’re in for an event next month. Funny how the tone changes and he suddenly wants to be our buddy when he no longer views us as the enemy. Now, instead, he’s cozying up to us. It’s really pretty transparent. I haven’t decided yet how to handle the situation, but the whole thing still pisses me off. Vindication–particularly where I knew that I had done ABSOLUTELY nothing wrong–is a very sweet thing. As so often happens, Brett Schulte’s run out of steam for blogging and is hanging it up. I regret that, as I have always enjoyed Brett’s insights and his book reviews. Hopefully, he will regain his muse and resume blogging sooner than later, but for now, it’s goodbye to Brett. Brett, if there’s ever anything you want to blog, just let me know, and you’re welcome to do so here as a guest blogger.